As has been said before, without down days, there would be no up days. And now we are into deep fall weather, and heading toward Thanksgiving and winter. Not good car time in the midwest, to be sure. There are a few not-so-cheery items: the passing of both Scott Taylor and Gary Byrd (in California) have caused pause in the realm of cars; the B20 needs its engine taken apart this winter, and the weather is no friend to open cars either. The recent economic tumble has taken some luster off the old car hobby, as well. There seems to be an introduction of sobriety into all of this. All is not grim – while the economy has been stalling, the American electorate has made a good choice. Chicago is in many ways both a small and big town, and it is possible to know some of these people first hand. It is nice to see David Axelrod (who was a classmate in college, and whose office is a block from mine) do so well, as he is a very straight-up thoughtful kind of guy. He and the others are a refreshing change from the dark side we’ve had far too long. So now is a time to settle down and examine what one has. Work on Aurelia material goes on. 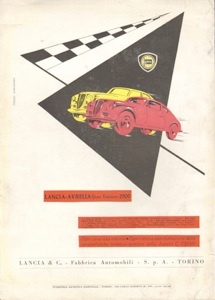 I’ve located some lovely early Nardi and Lancia advertisments from the 1950’s – it seems that Lancia was more active in its graphics for a period c. 1953 than we might imagine. While we are a long way from that time, there are still lessons to learn. 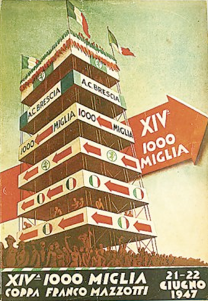 Wishing everyone good health, happy motoring and buono fortuna.